on Raymond St. - under the night sky so dress warm! Parte del Festival de Cine "Dia del Trabajador," presentamos "El Jardin," un documental acerca de la lucha para un jardin comunitario en Los Angeles. Cine Gratuito baja las estrellas en el Jardin Comunitario de la Playa porque sabemos que "la tierra es de quien la trabaja." 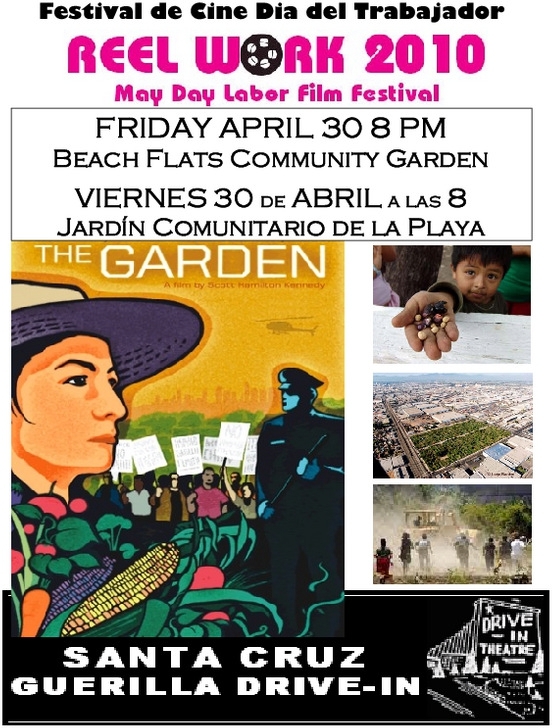 As part of the Reel Work May Day Labor Film Festival, the Guerilla Drive-In presents "The Garden," about the fight for the South Central Farm. We'll show the film under the stars in the Beach Flats Community Garden because we know "the land belongs to those who work it"